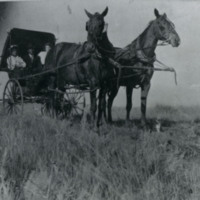 Collection of photographs and documents from the McPherson County Pioneer Museum in Eureka, SD. 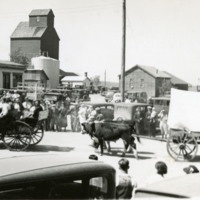 These unique documents depict the history of Eureka, South Dakota. Sepia tone photograph mounted on tan cardboard. 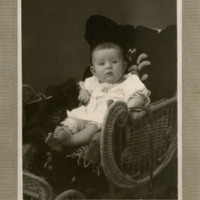 Sepia tone photograph with white outlining boarder. 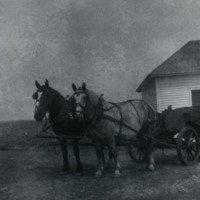 Photograph has the description "Fire Escape on Old Grade School House in Eureka" written in black ink below it. Black and white photograph. Photograph is scratch and blurry. Black and white photograph. 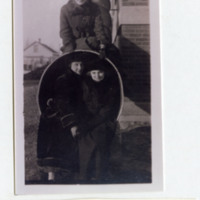 Photograph is dark and damaged. Black and white photograph. Photograph is overexposed on the right side. 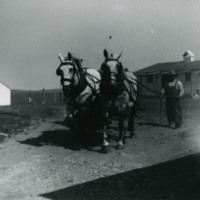 Black and white photograph. Photograph has tears on the lower left corner and is darkend on the right left corner. 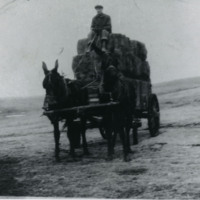 Sepia tone photograph with white surrounding boarder. Photograph is ripped on the top and left side. 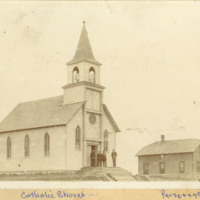 Writing in blue ink below photograph "Catholic Church- Parsonage". 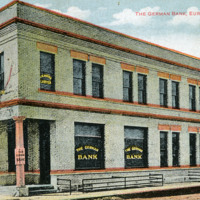 The German Bank, Eureka, S. Dak. Colored postcard. 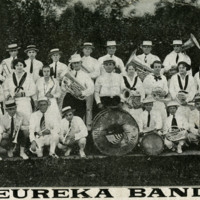 Postcard contains the title "The German Bank, Eureka, S. Dak.